Curiosity can be heavy handed. Its drill, used to investigate geological samples on Mars, has frequently broken the rocks that NASA scientists have wanted to peer inside. But a new software update means that now it can go more gently with its drill. Curiosity has six settings on its drill. Between the softest and hardest setting, there's an almost 20-fold increase in energy. In the past, the default drilling software has stated at Level 4—the fourth highest energy setting. When Curiosity arrived at Mount Sharp last year, the first sample it drilled broke under the force, and there had been numerous similar incidents beforehand. 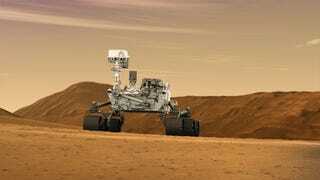 Now, a new algorithm has been sent up to Curiosity that ensure that drilling always starts at Level 1 and only increases if progress is too slow. "Curiosity's drill is essentially a hammer and chisel, and this gives us a way not to hammer as hard," John Michael Morookian, who works on the Curiosity sampling team, told Sen. The first sample to be drilled with the new algorithm aboard was called Mojave 2. Using the first two drilling settings, the rover created a hole 2.6 inches deep in ten minutes, causing no damage to the sample (see above). Now, NASA scientists are working out what the crystals within the rock can tell us about the Martian landscape. Meanwhile, Curiosity has spent the last few weeks exploring Pahrump Hills, which sits at the bottom of Mount Sharp.